With over 25 million registered users and 12 million completed projects, Freelancer.com is one of the most popular online marketplaces. It operates on a commission and monthly membership fee model: both the employer and freelancer pay an hourly or project fee, with the commission varying depending on the membership level of both parties. One limitation is that freelancers can only submit up to 8 proposals in a month before they’re forced to upgrade to a paid account, which may be a deterrent for freelancers just starting out. Freelancer is definitely one of the biggest freelancer websites out there, with millions of members joining the site over the years. Along with the large user-base comes an even larger problem that has been at the forefront of Freelancer’s dip in popularity. I am of course talking about the extent of spam posts and spam applicants that the platform seems to attract without having the ability to control it at all. With that said though, Freelancer does reach a global audience and helps many small to large sized organisations get tasks done for little cost. Wondering if Freelancer is the best option for getting your project done? Freelancer claims to have a database of more than 7 million users, which is a staggering figure to say the least. While this used to be a big positive point, over the years the lack of control Freelancer has over spam applicants and posts has made it a serious issue for the company. The old say of ‘quality over quantity’ certainly rings true here as you can get lost in a minefield of low quality posts, and tons of low-quality applicants bidding on your jobs. If you are happy to receive hundreds of applicants and shockingly low-prices, then you won’t be fussed by Freelancer, but for those looking for a clearer outlook, Freelancer certainly proves to be an issue. You can find freelancers and employers from all over the globe, but the current Asian invasion on the freelance market has flooded Freelancer the most. The major part of the active subscribers of the site are from India, China and Philippines, alongside with way more qualified and reliable specialists from Eastern Europe, which also agree to work for wages below the minimal survival level. The other 10% of the applicants would be the scarce highly skilled professionals from the Old World and the USA who had been working through Freelancer since its very first days and who are not willing to leave the sinking ship. They have the highest level premium account and all the possible badges available on Freelancer, but in most of the cases employers prefer to hire a cheaper workers with less experience. Scams and frauds became another plague of Freelancer these days. Should you hire a reasonably good freelancer, make sure you have a senior developer or an editor who’d be able to make almost inevitable improvements. One may agree or disagree with the feature set and policies available through Freelancer, but it’s hard to shrug off the fact that Freelancer is the web-freelance resource that actually invented the ways most similar platforms work. Despite the tons of spam and inadequate bidders, Freelancer keeps blooming and engrossing the less business-savvy rivals. Various badges, levels and complicated XP system used for ranking is something of their own unique invention, which other freelance websites have adopted and improved to eventually surpass Frelancer.com. Freelancer’s navigation might seem a bit complicated for a first-time user, but in fact everything is highly intuitive and – let’s face it – with so many features Freelancer has to provide to its clients, there could hardly have been less menus and buttons. The registration process is simple, and you may even skip it in favor of logging in through your Facebook account. 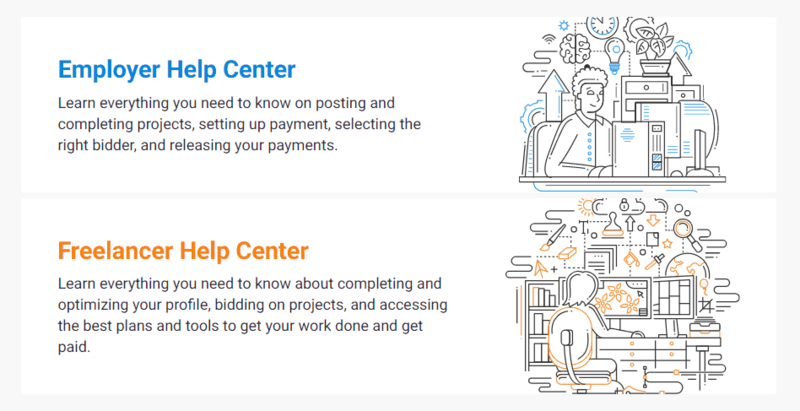 You can register as a freelancer looking for work, a customer seeking for contractors, or get an account enabling you to perform both of these functions. Once you’re in you’ll be prompted to complete your profile and add a portfolio as well as perform a lot of other tasks that will make your profile rank higher and seem more legit and attractive to potential clients. As a customer, you will get tons of applications per each and every job posting, but bear it in mind that a major part of those applications are automated and generated by scripts. This is done by freelance slave-driver agencies, posting as individual contractors who’ll promise to do the work insanely cheaply. They will even do it – but the resulting work created by severely underpaid workers will be poor. Freelancer has a 24/7 live-chat support, but it’s not actually an instant means of troubleshooting, as the operator assigned to you may easily turn out to be “away” in the chat. However, you can always resort to the FAQs, extensive troubleshooting section, write an e-mail or submit a ticket. Freelancer – with its extreme money-sucking policies – is not making money on the monetary transactions between the employers and the freelancers after a job well done. Freelancer.com is totally indifferent – if not to say “oblivious” – towards your activity on the site, as long as you are feeding it with your cash for acquiring new levels and ranking higher in the freelance lists. However, unlike iFreelance, which takes your monthly fee and leaves you the hell alone, Freelancer.com does not forget to get its cut of your money. The only thing that justifies this and the extremely high premium account fees is that you can save a lot of money hiring cheap workforce through Freelancer. Initially, you start out with a totally free account, but you have to pay to unlock more options and lower the transaction fees. The tests available for freelancers are all priced $5 and above. You can pay to make your job posting or bid show #1 in the list of similar offers. There are various ways to pay and withdraw money from Freelancer. You can use your verified credit card, PayPal, Skrill or Moneybookers account to deposit or withdraw funds. The payment protection mechanism allows freelancers to ask for an upfront payment, and for the customer to demand complete satisfaction in return. There is a whole section on the site, dedicated to resolving disputes between freelancers and customers. The 1 month free trial allows both freelancers and customers to try it out without for paying services fees, but of course, that doesn’t mean you get free work done. You would still need to pay the freelancers you hire. Freelancer was and still is a giant in the web freelancing market. The site itself is excellent, but a bit too greedy when it comes to giving you anything for free or promoting your profile. The hype and shameless promotion played a nasty trick on Freelancer: it is the most popular and populated site, but this is precisely what has lowered its actual value for customers. However, as long as there are people willing to resort to the cheapest labor possible to have good-looking profiles, Freelancer will still be one of the key freelance websites out there.